None of us enjoy paying the absurd prices we have to pay for monthly cell phone service. Finally, there is a solution! Most networks have a feature allowing you to call a certain number of contacts, on any network for free, anytime. We’ll exploit this feature allowing you unlimited free cell minutes! It is a tool for reverse engineering 3rd party, closed, binary Android apps. It can decode resources to nearly original form and rebuild them after making some modifications; it makes possible to debug smali code step by step. Also it makes working with app easier because of project-like files structure and automation of some repetitive tasks like building apk, etc. DuoVero, Overo and Verdex Pro COMs will boot directly from a properly prepared microSD card. This step-by-step procedure explains how to partition and format a bootable microSD card using a Linux development computer. For instructions on writing a new image to flash memory of your Gumstix COM, see these instructions instead. These instructions supersede older instructions. If you still need the old instructions, you can find them here. Note: The following instructions are intended for experienced Gumstix users. Beginners are recommended to use Linaro or Sakoman's daily GNOME builds. After cumbersome reading, a bunch of not so good howtos, and a lot of plain wrong information I finally got it right. Since I did not want to fetch the extra large build environment for the whole Android platform, I only checked out the kernel the can be used with the emulator. It is called Goldfish. 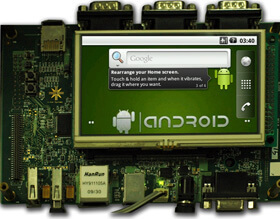 The goal of the project was to show off Android operating system on demo board used for presentation purposes. Adapt Linux kernel to target hardware and run Android on it. Functionally, Beaglebone is connected to Android powered (phone / tablet) device over USB, the Beaglebone operates USB in host mode (powers the bus and enumerates devices) and the Android-powered device acts as the USB device. Beaglebone runs the Android USB accessory protocol with application software, detects & enumerates the Android-powered device (phone/tablet) and starts the sample application (beaglebone side) that waits for commands from Android device (running sample accessory apk) to control/monitor the Beaglebone peripherals. Why use TI's StarterWare software package as a base software v/s Linux or u-boot ? Android is an open-source software framework that includes an operating system, middleware and applications.Given the success of Android, e-con Systems strongly believes that Android would spread its wings out of consumer devices to Industrial Handhelds, Industrial Automation, etc. The entry of Android into the Car Infotainment Market further substantiates this thought process. This document will describe in detail the procedures for booting a Linux kernel image and mounting a root file system over nfs on the Freescale i.MX53 Quick Start Board. The Android Software Development Kit (SDK) allows developers to create applications for the Android platform. The Android SDK includes sample projects with source code, development tools, an emulator, and required libraries to build Android applications which are written using the Java programming language. Much of the info in this guide comes from the documentation on the Android Developers site. Follow this quick guide to successfully install Android SDK on your computer. If you are new to it, it is a bit complicated to install compared to your usual program. However if you are good in following instructions, it’s as easy as A-B-C.
under skin in the device configuration you should see Galaxy_S2 in the dropdown. Any embedded devices these days use the U-Boot bootloader. This bootloader stores its configuration into an area of the flash called the environment that can be manipulated from within U-Boot using the printenv, setenv and saveenv commands, or from Linux using the fw_printenv and fw_setenv userspace utilities provided with the U-Boot source code. This environment is typically stored in a specific flash location, defined in the board configuration header in U-Boot. The environment is basically stored as a sequence of null-terminated strings, with a little header containing a checksum at the beginning. While this environment can easily be manipulated from U-Boot or from Linux using the above mentioned commands, it is sometimes desirable to be able to generate a binary image of an environment that can be directly flashed next to the bootloader, kernel and root filesystem into the device’s flash memory. For example, on AT91 devices, the SAM-BA utility provided by Atmel is capable of completely reflashing an AT91 based system connected through the serial port of the USB device port. Or, in factory, initial flashing of devices typically takes place either through specific CPU monitors, or through a JTAG interface. For all of these cases, having a binary environment image is desirable. The Angstrom OE distribution does not build the tools automatically. I'm a novice at OE and bitbake, so here are the instructions for building and installing the tools manually. Theses instructions assume that you have already built the angstrom distribution for the beagle board. Substitute directories and compiler locations to match your environment. cd to the source for U-Boot in the OE tree. For me, it is at "../oe/tmp/work/beagleboard-angstrom-linux-gnueabi/u-boot-git-r18.1/git"
MIPS CPUs were designed from the beginning with UNIX in mind, and MIPS-based workstations and servers have run just about every flavour of UNIX ever written - ATT, BSD, Mach, and of course Linux. There are still a lot of MIPS-based workstations and servers out there, many of them orphaned by their manufacturers but still servicable. And there are many more consumer and embedded platforms being built around MIPS CPUs. Linux provides an open-sourced OS solution for both sorts of systems. The LPC1114FN28 for a while now (at least, as excited as one could be about a microcontroller). The LPC1114FN28 is a microcontroller from NXP with an ARM Cortex-M0 core in a 28 pin DIP package. With 32k of flash and 4k of RAM, this chip isn’t the biggest or baddest on the block, but at $1.50 in small quantities, it has just about every other uC beat in the performance-per-dollar arena. It’s got the basic peripherals, SPI, Serial, ADC, and I2C. It’s programmable via SWD or serial bootloader. Though I don’t use a breadboard too often any more, it’s great to have an easy-to-prototype ARM chip in my box. Unfortunately, these chips are notoriously difficult to work with, especially with open source tools. CLICK HERE to get SPIN THE HOTTIE - The hottest Truth or Dare iPhone App...period! The iPorsche Remote app is supposed to control a full-sized 911. However, as you can see from this video, the program still has some flaws to work out. It may still be the Coolest iPhone App Ever, but it is taking a pretty healthy development budget given all the totaled Porsche's. Overview The Anywhere Software Application allows you to control your vehicle via your mobile phone. This requires you to have a Connect2Car Anywhere Unit installed in your vehicle. This software communicates with your vehicle via the Data or SMS connection on your phone.